Did you know there are 3 types of water losses? 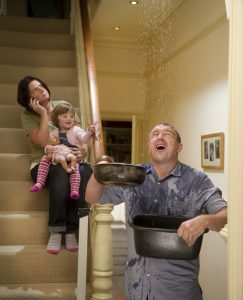 When you call someone in to take care of water that’s overflowed, leaked or seeped in, you can help your insurance company and water damage contractors along by letting them know what type of water issue you are having so they can be prepared with the proper equipment and they can start right away! Danger Level to Humans: Low, as long as it’s treated quickly. Most Common Sources: Water supply line problems, overflowing sinks, rain, and snow. Danger Level to Humans: Moderate; may cause illness and discomfort. Most Common Sources: Toilet bowls, sump pumps, dishwashers, or washing machines. Important Facts: Category 2 Water Losses contain chemicals not fit for consumption. Carpet pads must be removed, and carpet that is saved must be treated with hot-water extraction. Within 48 hours, if left untreated, it moves to a Category 3 Loss and becomes a great deal more expensive. Danger Level to Humans: High; can cause serious illness if not handled properly. Most Common Sources: Any sewage or toilet backflows, as well as ground surface water carrying silt and organic matter. Important Facts: Safety of occupants and workers is paramount with a Category 3 Water Loss. Proper disposal of affected materials is critical. Stop the water source if safe to do so. Turn off the water main. Do not enter the affected area without the appropriate waterproof footwear. If the source of the water is known to be contaminated, regular footwear can be insufficient to control the exposure. Always wash your hands after leaving the affected area. Infection control is critical to your health as well as others occupying the building. Turn off all electricity at the main panel only if it is an unaffected area and you are qualified to do so. Remove/protect items that are at risk. Do not turn on fans or heating and air conditioning units in an attempt to dry the water. This can spread contamination. Need help with a water issue? Call 24Restore, we answer our phones and are available to help 24/7/365 in the Minneapolis area.